The above chart, when it was unveiled at the end of November last year, got some mileage on my Twitter feed so it got some attention. A reader, Eric N., didn't like it at all, and I think he has a point. Here are several debatable design decisions. The chart uses an inverted axis. A tax cut (negative growth) is shown on the right while a tax increase is shown on the left. This type of inversion has gotten others in trouble before, namely, the controversy over the gun deaths chart (link). The green/red color coding is used to signal the polarity although some will argue this is bad for color-blind readers. The annotation below the axis is probably the reason why I wasn't confused in the first place but the other charts further down the page do not repeat the annotation, and that's where the interpretation of -$2,000 as a tax increase is unnatural! The chart does not aggregate the data. It plots 25,000 households with 25,000 points. Because of the variance of the data, it's hard to judge trends. It's easy enough to see that there are more green dots than red but how many more? 10 percent, 20 percent, 40 percent? It's also hard to answer any specific questions, say, about households with a certain range of incomes. There are various ways to aggregate the data, such as heatmaps, histograms, and so on. For those used to looking at scientific charts, the x- and y-axes are reversed. By convention, we'd have put the income ranges on the horizontal axis and the tax changes (the "outcome" variable) on the vertical axis. The text labels do not describe the data patterns on the chart so much as they offer additional information. To see this, remove the labels as I have done below. Try adding the labels based on what is shown on the chart. Perhaps it's possible to illustrate those insights with a set of charts. While reading this chart, I kept wondering how those 25,000 households were chosen. This is a sample of households. The methodology is explained in a footnote, which describes the definition of "middle class" but unfortunately, they forgot to tell us how the 25,000 households were chosen from all such middle-class households. The decision to omit the households with income below $40,000 needs more explanation as it usurps the household-size adjustment. Also, it's not clear that the impact of the tax bill on the households with incomes between $20-40K can be assumed the same as for those above $40K. Are the 25,000 households is a simple random sample of all "middle class" households or are they chosen in some ways to represent the relative counts? It's also useful to know if they applied the $40K cutoff before or after selecting the 25,000 households. Ironically, the media kit of the Times discloses an affluent readership with median household income of almost $190K so it appears that the majority of readers are not represented in the graphic at all! The visual story published by the New York Times on hurricane Irma is a masterpiece. See the presentation here. Maps are great at conveying location and direction but much is lost in this rendering - wind speeds, time, strength, energy, to name but a few. The Times then switches to other chart forms to convey some of the other data. A line chart is used to convey the strength of wind speeds as the storms shake through the Atlantic. Some kind of approximation is used to straighten the trajectories along an east-west orientation. The key insight here is how strong Irma was pretty far out in the Atlantic. The lines in the background can be brought to live by clicking on them. This view omits some details - the passage of time is ignored, and location has been reduced to one dimension. The display then switches again, and this time it shows time and wind speed. This shows Irma's strength, sustaining Category 5 level windss for three days. This line chart ignores location completely. Finally, a composite metric called cyclone energy is introduced. This chart also ignores location. It does show Irma as a special storm. The storm that has reached the maximum energy by far is Ivan. Will Irma beat that standard? I am not so sure. Each chart form has limitations. The use of multiple charts helps convey a story from multiple perspectives. A very nice example indeed. This chart is primarily a scatter plot of home prices against school quality, which is represented by average test scores. The designer wants to explore the decision to live in the so-called central city versus the decision to live in the suburbs, hence the centering of the chart about New York City. Further, the colors of the dots represent the average commute times, which are divided into two broad categories (under/over 30 minutes). The dots also have different sizes, which I presume measures the populations of each district (but there is no legend for this). This data visualization has generated some negative reviews, and so has the underlying analysis. In a related post on the sister blog, I discuss the underlying statistical issues. 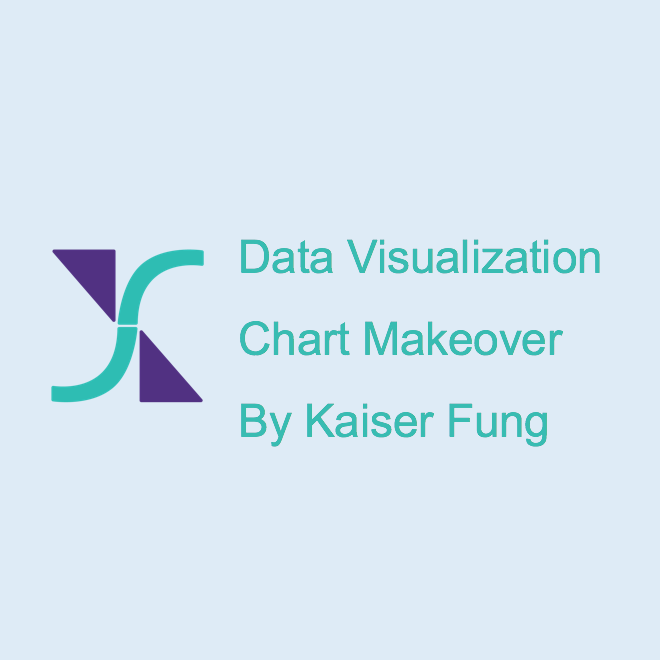 For this post, I focus on the data visualization. One positive about this chart is the designer has a very focused question in mind - the choice between living in the central city or living in the suburbs. The line scatter has the effect of highlighting this particular question. Boy, those lines are puzzling. Each line connects New York City to a specific school district. The slope of the line is, nominally, the trade-off between home price and school quality. The slope is the change in home prices for each unit shift in school quality. But these lines don't really measure that tradeoff because the slopes span too wide a range. The average person should have a relatively fixed home-price-to-school-quality trade-off. If we could estimate this average trade-off, it should be represented by a single slope (with a small cone of error around it). The wide range of slopes actually undermines this chart, as it demonstrates that there are many other variables that factor into the decision. Other factors are causing the average trade-off coefficient to vary so widely. The first instinct may be to interpret the locations on the home-price-school-quality plot as geographical. Such misinterpretation is reinforced by the third factor being commute time. Additionally, on an interactive chart, it is typical to hide the data labels behind mouseovers or clicks. I like the fact that the designer identifies some interesting locales by name without requiring a click. However, one slight oversight is the absence of data labels for NYC. There is nothing to click on to reveal the commute/population/etc. data for central cities. In the sister blog post, I mentioned another difficulty - most of the neighborhoods are situated to the right and below New York City, challenging the notion of a "trade-off" between home price and school quality. It appears as if most people can spend less on housing and also send kids to better schools by moving out of NYC. In the New York region, commute times may be the stronger factor relative to school quality. Perhaps families chose NYC because they value shorter commute times more than better school quality. Or, perhaps the improvement in school quality is not sufficient to overcome the negative of a much longer commute. The effect of commute times is hard to discern on the scatter plot as it is coded into the colors. One key insight is that San Francisco homes are on average twice as expensive as Boston homes. Also, the variability of home prices is much higher in San Francisco. By using the same vertical scale on both charts, the designer makes this insight clear. But what about the horizontal scale? There isn't any explanation of this grade-level scale. It appears that the central cities have close to average grade level in each chart so it seems that each region is individually centered. Otherwise, I'd expect to see more variability in the horizontal dots across regions. If one scale is fixed across regions, and the other scale is adapted to each region, then we shouldn't compare the slopes across regions. The fact that the lines are generally steeper in the San Francisco chart may be an artifact of the way the scales are treated. Finally, I'd recommend aggregating the data, and not plot individual school districts. The obsession with magnifying little details is a Big Data disease. On a chart like this, users are encouraged to click on individual districts and make inferences. However, as I discussed in the sister blog (link), most of the differences in school quality shown on these charts are not statistically meaningful (whereas the differences on the home-price scale are definitely notable). If you haven't already, see this related post on my sister blog for a discussion of the data analysis. The New York Times spent a lot of effort making a nice interactive graphical feature to accompany their story about Uber's attempt to manipulate its drivers. The article is here. Below is a static screenshot of one of the graphics. The illustrative map at the bottom is exquisite. It has Uber cars driving around, it has passengers waiting at street corners, the cars pick up passengers, new passengers appear, etc. There are also certain oddities: all the cars go at the same speed, some strange things happen when cars visually run into each other, etc. This interactive feature is mostly concerned with entertainment. I don't think it is possible to infer either of the two metrics listed above the chart by staring at the moving Uber cars. The metrics are the percentage of Uber drivers who are idle and the average number of minutes that a passenger waits. Those two metrics are crucial to understanding the operational problem facing Uber planners. You can increase the number of Uber cars on the road to reduce average waiting time but the trade-off is a higher idle rate among drivers. One of the key trends in interactive graphics at the Times is simplication. While a lot of things are happening behind the scenes, there is only one interactive control. The only thing the reader can control is the number of drivers in the grid. As one of the greatest producers of interactive graphics, I trust that they know what they are doing. In fact, this article describes some comments made by Gregor Aisch, who works at the Times. The gist is: very few readers play with their interactive graphics. Someone else said, "If you make a tooltip or rollover, assume no one will ever see it." I also have heard someone say (hope this is not merely a voice in my own head): "Every extra button or knob you place on the graphic, you lose another batch of readers." This might be called the law of the interactive knob, analogous to the law of the printed equation, in the realm of popular book publishing, which stipulates that every additional equation you print in a book, you lose another batch of readers. Several years ago, I introduced the concept of "return on effort" in this blog post. Most interactive graphics are high effort to produce. The question is whether there is enough reward for the readers.